The national debt is the total general government debt of the state. Hong Kong is part of China, but it is defined as a special administrative region (SAR). It has its own government and its own country and it is counted as a separate entity from the People’s Republic of China by international financial monitoring bodies. The IMF calculated that the debt to GDP ratio of Hong Kong was 0.055% of the country’s GDP at the end of 2017. Economists are particularly interested in a country’s national debt in relationship to its income. The income of a country is called the Gross Domestic Product, or “GDP.” So the standard national debt metric is called the debt to GDP ratio. When economists refer to “national debt” they really mean government debt. The government debt is only counted as part of the national debt if it is represented by formal contracts, such as bank loan agreements or government bond sales. The debts of private businesses in Hong Kong are not counted as part of the country’s national debt. The private debts of the inhabitants of the country are also excluded from the national debt figure. Hong Kong has highly developed financial markets and a large percentage of the population that speaks English. These two factors, together with a legal system that is based on English law have made Hong Kong one of the financial centers of the world. The country attracts a lot of money and the high value of property there means that property taxes just about cover all of the small government’s costs. 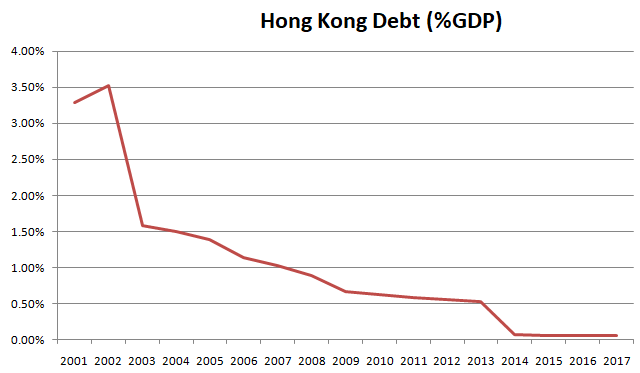 Hong Kong has always had an extremely low level of debt, as the chart below shows. South-East Asia has experienced two financial disasters in the past few decades. The first was the Asian Financial Crisis of 1997 and the second was the global liquidity crisis of 2008. Neither of these events caused problems in Hong Kong and the government did not need to take on extra debt in order to keep its national economy afloat in the way that many developed countries had to do. A combination of constant success and an escape from world financial shocks means that Hong Kong has managed to pay down its low level of debt to almost nothing. Who manages Hong Kong’s national debt? The SAR government created the Hong Kong Monetary Authority to handle the region’s financial activities. Hong Kong is not a sovereign state — it is part of the People’s Republic of China, so it cannot have its own central bank. However, the region has its own currency, the Hong Kong Dollar, and so it needs an institution to manage that money. The Hong Kong Monetary Authority is effectively the central bank of the region and it is in charge of managing government debt as well as being the authority over the money supply. The Hong Kong Monetary Authority is in charge of managing the sale of new issues of Hong Kong government securities. What is Hong Kong’s credit rating? 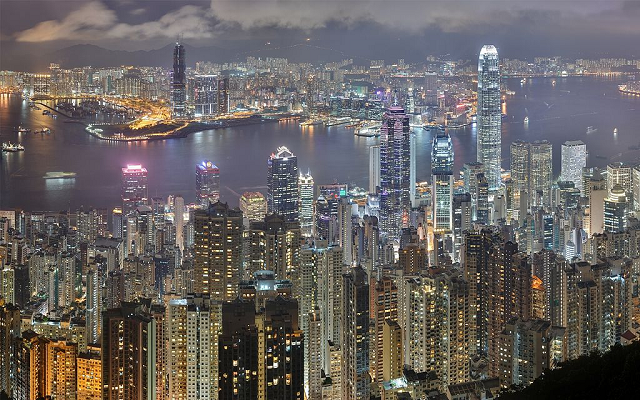 Despite being one of the richest areas of the planet with almost no debt, the Special Administrative Region of Hong Kong does not enjoy the top credit rating. The very best rating is “AAA.” Hong Kong’s rating is a little The table below shows the rating awarded to the SAR by the three top credit rating agencies. These are high-grade ratings. The “Stable” outlooks means that the ratings awarded by the agencies is unlikely to change in the near future. How does the Hong Kong government raise debt? The primary market is an auction carried out by the HKMA selling to primary dealers. The secondary market is made up of recognized dealers trading through their HKMA accounts. The primary dealers resell their bond allocations into this market. Although trading of bonds in the secondary market can only be carried out by registered recognized dealers through their HKMA accounts, the prices of the bonds are listed on the Stock Market of Hong Kong. What facts should you know about Hong Kong's national debt? You could wrap $1 bills around the Earth 526 times with the debt amount. If you lay $1 bills on top of each other they would make a pile 14,750 km, or 9,166 miles high. That's equivalent to 0.04 trips to the Moon.